The battle between copyright owners and users uploading their content on different video sharing sites has been going on and on for so long that any lawsuit thrown in to stop the revolution has failed. Television networks, movie studios have sued video sharing sites to that point that the settlement money has become ridiculously massive and seemingly impossible to pay. To keep making a buck off their content, copyright owners are now looking at the prospect of spamming their videos with ads and sharing the revenue with the video sharing sites. This way, everybody benefits. Forrester Research analyst James McQuivey says, "Two years ago the solution was ‘Let’s sue YouTube and block this.’ It really hasn’t worked. 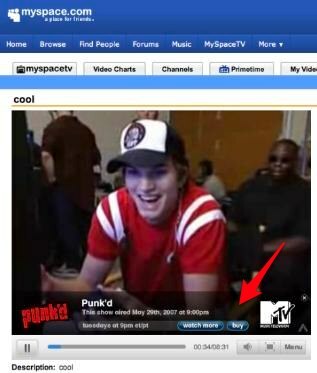 Now the solution is ‘Let’s create a system where content can derive some benefit.’ "
MTV Networks is now realizing this and is in talks with MySpace to come up with a deal that will pair advertising with clips from "The Daily Show With Jon Stewart," "Punk’d" and other shows that MySpace users upload to the social network site, whether they have permission or not. The business model is nothing new. Youtube has been doing this for nearly a year and has seen some success in the area. The technology is nothing new either. Auditude, the company that will be providing the advertising platform for the MTV-MySpace deal will be using a similar algorithm to Youtube’s that identifies video clips and then offers copyright holders a choice between removing the material or letting MySpace place ads on it in exchange for a piece of the revenue.